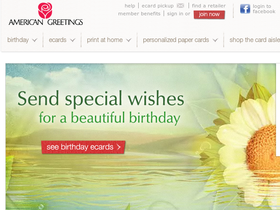 American Greetings, online at AmericanGreetings.com, is your one-stop shop for social greetings. This company offers greeting card brands such as American Greetings, Carlton Cards, Gibson, Recycled Paper Greetings, and Papyrus. American Greetings also has the largest collection of electronic greetings on the web, with products including ecards, photo cards, printable cards, invitations, wallpapers, and screensavers for any and all occassions. Browse RetailSteal.com for all the best American Greetings promotions, American Greetings coupons, and American Greetings discounts. Shipping rates and information vary. See AmericanGreetings.com for more information. Use this coupon code on American Greetings to enjoy free shipping on your entire purchase. Join AmericanGreetings.com and save 25% on all PhotoWorks products. Click link now to start. At American Greetings, get a free 30-day risk free trial. Click link now. Visit AmericanGreetings.com to get your free 14-day trial and start sending cards. Click link now. Send and print free eCards at AmericanGreetings.com. Click link to start. When you shop at American Greetings, get a free eCard when you buy an Amazon.com Gift Card. Click link to buy.